Be the first to share your favorite memory, photo or story of Weldon. This memorial page is dedicated for family, friends and future generations to celebrate the life of their loved one. Weldon Dean Allen was born September 2, 1931 to Florence (Pickens) Allen and Willis Allen in Southard, Oklahoma. Weldon passed away on November 30th at the age of 87 years at Hillside Village in De Soto Kansas. Funeral service will be held on December 3, 2018 at 10:30AM with visitation starting at 10:00AM at Cedar Crest Memorial Chapel, 32665 Lexington Ave., De Soto, KS. Graveside at De Soto Cemetery, De Soto, KS. Weldon grew up in Southard and attended and graduated from Southard High School. After graduation, he served in the Army during the Korean War, stationed in Ft. Hood, Texas. He married Leola (Lee) Fountain in 1951, which was the beginning of 67 years of marriage. Together, they lived in many places, including Texas, Oklahoma, Kansas, and Missouri. Weldon and Lee were blessed with three children: Barbara, Skip, and Scott. Weldon graduated from Southwestern Oklahoma State College with his bachelor’s degree and later his Master’s degree. He taught school and was an elementary principal for over 35 years, most recently as the principal of Plains Elementary in Plains KS. In retirement, Weldon and Lee enjoyed traveling with family and friends. Weldon loved to fish, especially in Colorado and Canada, and he looked forward to taking his granddaughters fishing in the pond by their house. He was an active member of the Gower, Missouri Baptist Church and Gower American Legion Post 0393. Those preceding him in death were his son Skip, his parents Florence and Willis Allen, brother Verdon, and sister Nola and brother-in-law and Bud Fielder. 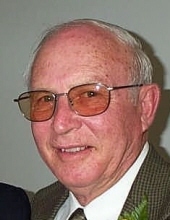 He is survived by his wife Lee, daughter Barb (husband Wayne) and son Scott, (wife Linda) and five granddaughters Michelle Overholt (husband David), Melissa Ginnings (husband David), Kaitlyn Scott (husband Adam), Sarah Allen, and Hannah Allen, and great-grandchildren, Sophia and Sam Ginnings and Olivia Scott. He will be remembered as a loving husband, father, grandfather, and great-grandfather. He will also be missed by his brothers- and sisters-in-law, nephews, nieces and friends. The family would like to express our appreciation to the staff at Hillside Village Care Center. They have demonstrated incredible genuine care and loving compassion for Weldon and his family for the past four years. To plant a tree in memory of Weldon Dean Allen, please visit our Tribute Store. "Email Address" would like to share the life celebration of Weldon Dean Allen. Click on the "link" to go to share a favorite memory or leave a condolence message for the family.